Eastern Phoebes are one of the first songbirds to arrive in New England during the spring migration. March can be a tough month for birders. Winter is getting long and the season seems to be extending each year. It’s already been a snowy month this year, counting Sunday, and remember last March was ridiculously cold and snowy, even pushing into April. March is also a time of anticipation for birders as the spring migration starts to pick up by the end of the month. Early red-winged blackbirds, for instance, began arriving in February, but March is really when the migration begins in New England. April, of course, is when it heats up significantly before peaking in May. By the end of March, however, we can expect to see birds such as tree swallows, purple martins and hermit thrushes returning to our region. To me, the surest sign of spring is the return of eastern phoebes in late March. The robin is still considered the traditional harbinger of spring even though many of them spent their winters in New England. I rejoice when I see the first phoebe perched on a branch in my backyard bobbing its tail endlessly. March birding is not limited to the late-month migrants. American woodcock, with their amazing evening aerial displays, are a highlight species of the month. I’ve never had great luck finding woodcock. Maybe this will be my year. (I say that every year.) Also, ducks start moving north to open water in big numbers in March. One of the best things about March birdwatching, however, is that it’s still winter and our winter birds are still around. Chickadees, titmice, nuthatches, cardinals, blue jays, mourning doves and woodpeckers still have the feeders to themselves, for the most part. Any winter finches that have come south to New England may still be around. I’m still getting dozens of pine siskins daily. I noticed another sign of spring in the bird world the other day as a male American goldfinch with bright yellow splotches visited the tube feeder. The brightness stood out as a shade of yellow not seen in many months. The barred owl barrage continues throughout New England, too, as reports pile up. A friend of mine had one visit a pine tree behind her unit in a condominium complex last week. The owl remained most of the day before disappearing in late afternoon. March may be tough in terms of waiting out the winter and anticipating what is to come, but it offers much to the patient birder. Photo by Chris Bosak A black-capped chickadee rests on an icy branch during a winter storm in Jan. 2019 in New England. Winter poses serious challenges for birds and other wildlife. The cold is the first thing that comes to mind. How do small birds such as chickadees and goldfinches survive sustained sub-zero temperatures? How do water birds such as gulls, ducks and geese stand on ice all day with bitter winds driving through them? Birds that remain in New England all year have adapted to the low temperatures. Cold may be a challenge, but it’s one they can handle. Chickadees and other birds have all sorts of adaptations to survive bitter cold days and nights. They increase their weight and fat percentage, they puff out their feathers to trap warm air close to their bodies, they huddle together for warmth, they drop their body temperature at night, and they eat a lot. Water birds have an extra layer of down feathers to keep dry and toasty. Also, their legs don’t freeze because of a magical counter-current heat exchange between their veins and arteries. It’s not magic, of course, but it’s a complex system worthy of its own column. Let’s just say their feet don’t have to be as warm as their bodies (otherwise they’d be covered in feathers) and the way their blood flows keeps the legs from freezing. 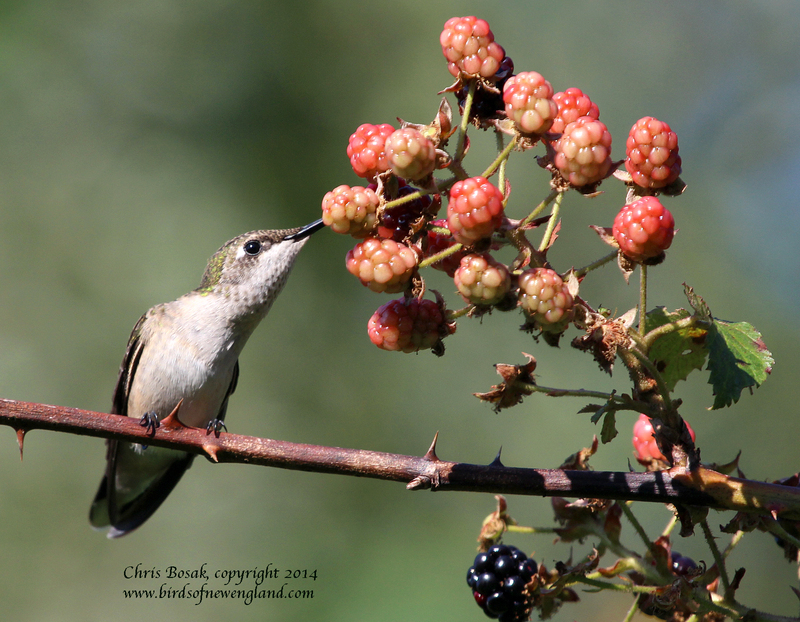 A female Ruby-throated Hummingbird sips juice from a berry in Norwalk, Conn., summer 2014. Click here for the column.